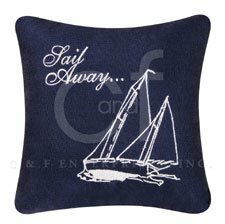 Outline of a white sailboat and phrase "Sail Away.." embroidered on a navy pillow. 10" x 10". We offer the complete ensemble in the Knotty Buoy pattern by C & F.